They thrive don't they? As so many introduced animals do. That was a good capture. As interesting as they are, they are not appropriate beasts to be in Australia. It is actually a fox. We don't get dingos here. SO.... is it a fox, dingo, or???? Neat picture. 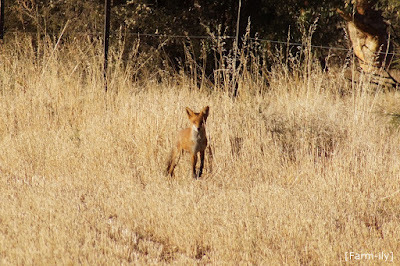 It is a fox, which as a species was introduced to Australia by settlers in the 1830's with devastating effect on our native wildlife. Definitely unwanted here. I was recently staying in the country and rose early to go for a walk with my camera. A fox and cub were playing happily in the garden. I was surprised at how close to the house they were.